Two Christmas' back Santa was kind enough to bring me the makings of a Tyranid Army (what a cool guy!). Over the last couple of years I've changed my approach to army building. Rather than picking up odds and ends as you go (and ultimately lose interest), I design the whole list, with a theme, and pick up all the pieces in one hit. It's then a marathon build, before undercoating en masse and painting a unit at a time. I'm not the quickest at getting models from the box to the battlefield; the Necromunda gang I posted about last week took a year to complete the ten models... Needless to say, my Tyranid horde isn't finished yet. However, I thought I'd put up a few pics of it in progress and hopefully spur myself on to do a bit more. Recently, I posted this pic of my Ork Ripper Swarm. This guy was inspired by the special rule 'The Sarge is Acting Strangely'. 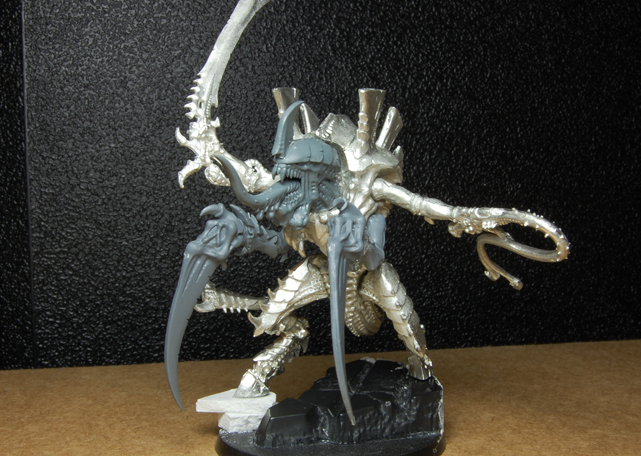 I'd had the idea for the conversion before seriously considering the army list and was a major catalyst for choosing the Parasite of Mortrex character as an HQ selection. The Inquisitor was another conversion that I'd had in my head for some time before starting construction of the list. 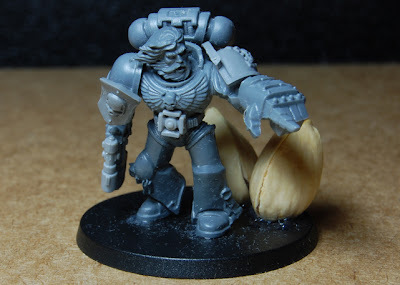 I didn't want to build yet another Space Marine list to incorporate him in, but wanted to have a reason to use him. I figured he'd been sent to the planet to investigate a xenos incursion, so depicted him tracking through some alien eggs. This is the finished article; pretty happy with the final piece. 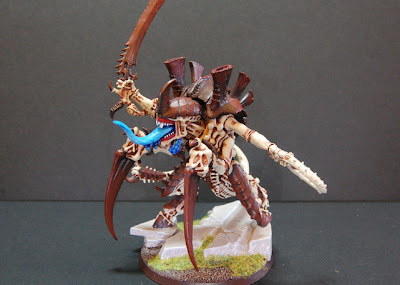 The colour scheme is deliberately close to that of the Tyranids in order to achieve coherency in the army, despite the variation of figures in the list. This has also given me the excuse to build some Guardsmen conversions that I'd dreamt up a while back, but didn't want to convert up a whole army. 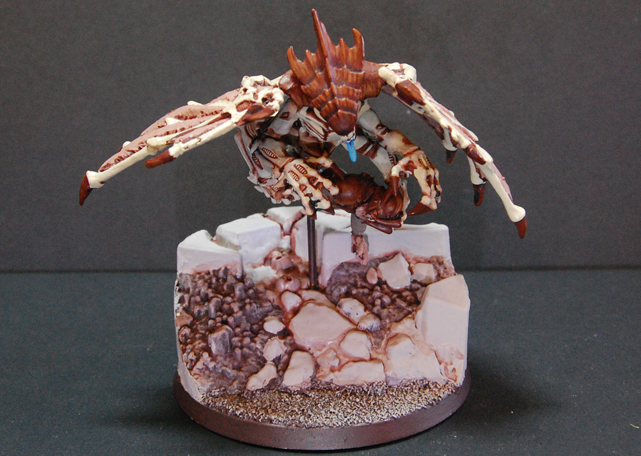 I'll get some pictures of the Inquisitor's inducted guard squad 'Ripper Swarms' up once they're painted. The swarm itself is lead by this Hive Tyrant. 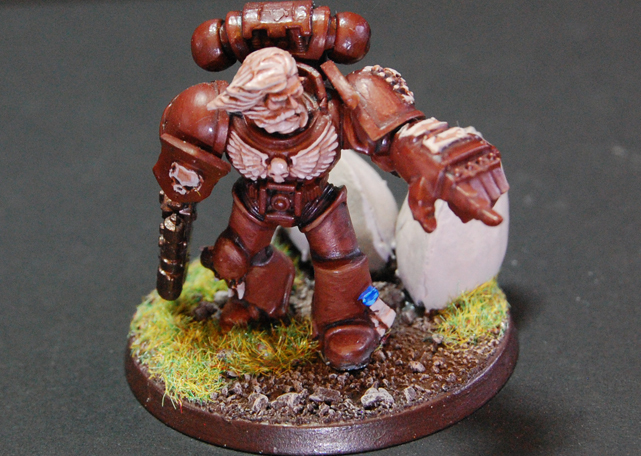 As always, I'm on the lookout for subtle ways of converting pieces up, so they're not totally bog standard. The main alteration here is a head swap from the Carnifex kit which needed a small amount of remodelling to fit the neck socket. Since building this, the kit has been re-released in resin, which would have been a stack easier to assemble. I tend to avoid metal figures that have more than two components, but this was a necessary evil. The worst part of the assembly process was getting the legs in place and fixing them substantially enough to support the rest of the figure. In the end, I used the power drill to bore a hole through the lower body in order to use some heavy gauge wire to fix it all together. This is the finished Hive Tyrant, albeit with a repainted tongue (originally green) as blue seemed a better contrast to the rest of the colour scheme and had already been used as a highlight colour on the Inquisitor. I always try and use as limited-a-pallette as possible when painting an army as it provides strong coherency between all the component parts. 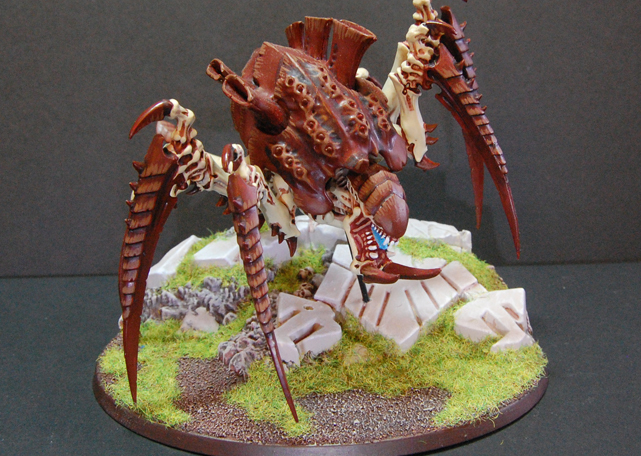 The army vanguard is lead by the Parasite of Mortrex, built from the Warrior kit with Forgeworld resin wings, another necessary evil as I've had problems with their products in the past. This thing is absolutely mental and has some quirky special rules. The vanguard is comprised of four Shrikes (winged warriors) and a brood of 20 Gargoyles. 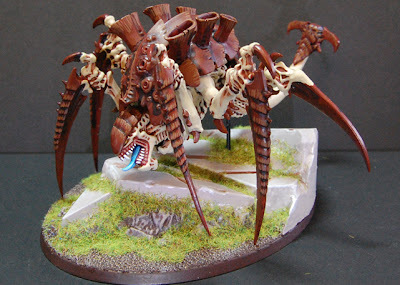 These guys should be able to close on enemy held objectives or key units in a short space of time and tie up any resistance until the main bulk of the army arrives to wipe them out. The army features two Tervigons as Troops choices rather than HQs, thanks to taking broods of Termagants. 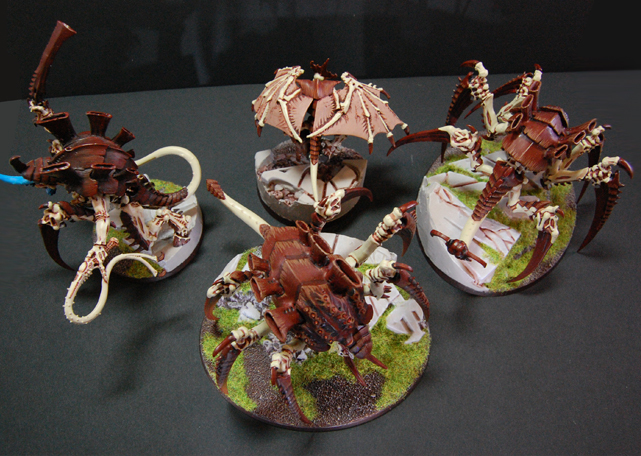 These things can give birth to 3D6 new Termagants each round, until you roll doubles, so could potentially add a couple of extra troops choices each, to the game before their birthing sacs dry up for the night. One of these bad boys will bolster the main bulk of the army with the Hive Tyrant, whilst the other will likely sit on the home objective, spewing out new troops units to help defend against enemies trying to capture it. Whilst being extremely useful and giving birth to new Termagants, lets not forget that these things are Monstrous Creatures too, so no slouch in combat. I'm hoping that they will be enough of a deterrant for most would-be challengers, but will be able to mix it up if the fighting gets hot. The other little modelling thing I wanted to try out with the main characters, was to use the collapsed aquila structure from the Honoured Imperium terrain set. In the pic above, you can just make out the shape of the aquila, when you stand the figures back-to-back. This was reasonably straight forward to achieve with a multi tool and a bit of household filler, and adds that extra bit of character to the army. Well, that's it so far; hope you guys like the results. 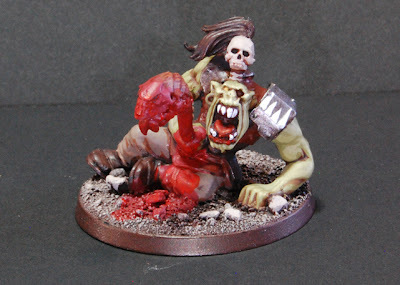 As ever, once I've got some more pieces painted up, I'll post some images.